A delightful twist on traditional pavlovas, these gorgeous little meringues are incredibly moreish. Preheat the oven to 120°C/ fan oven 100°C, gas ½, 250°F. Place the egg whites into a clean dry bowl, whisk until they form stiff peaks. Whisk in the caster sugar, a spoonful at a time, whisking well and at a high speed between each addition. Fold in a few drops of rosewater and pink food colouring. Drop six large dollops of the mixture onto the prepared baking sheets, making a little well in the middle of each. Bake in the oven for two hours, then turn off and leave in the warm oven for a further hour before removing. Allow to cool. 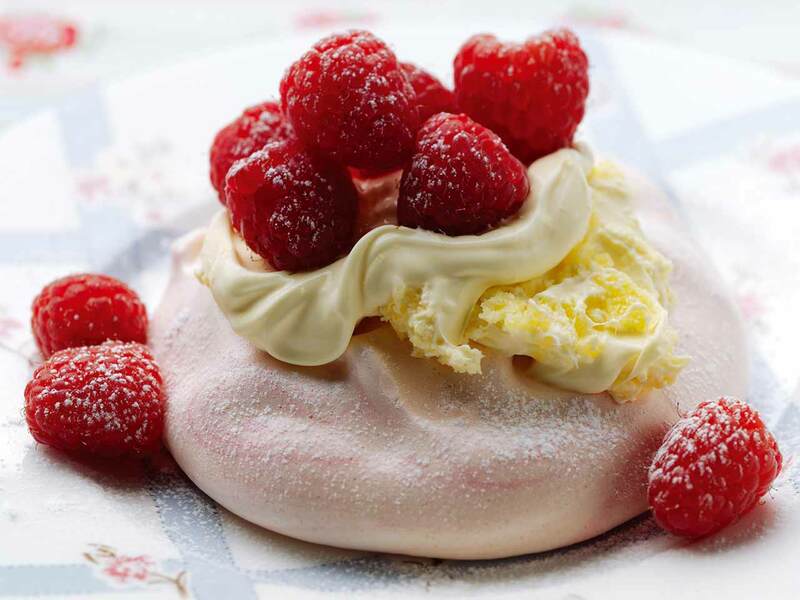 Spoon a dollop of Cornish clotted cream on top of each meringue and top with a handful of raspberries. Dust with icing sugar and serve. Omit the rosewater and pink colouring and add cocoa powder to the mixture for a chocolate version. Or, of course, you could omit all flavourings and simply serve in the traditional way with clotted cream and strawberries. Cooked meringues will keep in an airtight container for up to three weeks. Like Champagne, Cornish Clotted Cream is one of a small number of products to have its authenticity safe-guarded with a Protected Designation of Origin status. Therefore, Cornish Clotted Cream can only be made in Cornwall using local Cornish Milk and traditional Cornish processes. Rodda's Clotted Cream combines this with a secret cooking method - perfected over 120 years - that results in cream with a rich colour, silky thick texture and a delicate golden crust. Rodda’s Cornish clotted cream is available in most major supermarkets or online at www.roddas.co.uk.